Like realizing Barb and Helen (my former roomies) have started to lose all hope that I will one day find a guy. They sent me this awesome care package full of treats. After further inspection I realized they had essentially given me a Cat Lady 101 starter kit. Can't see them in detail? Don't worry I've picked out the best of the best. 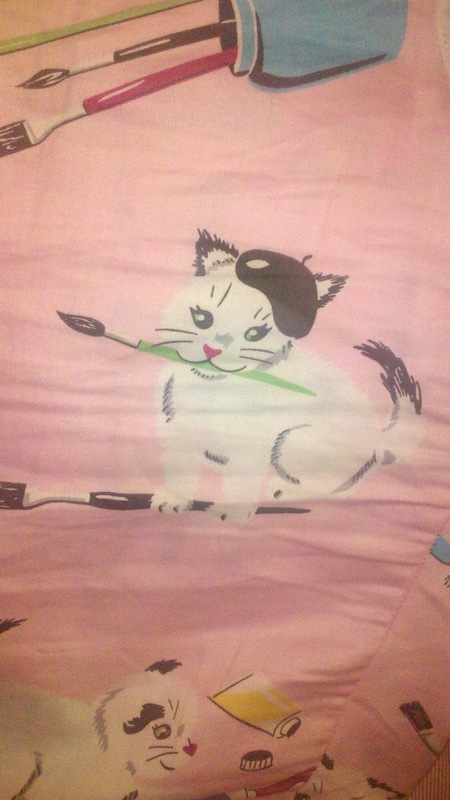 Cat wearing a beret. Duh. 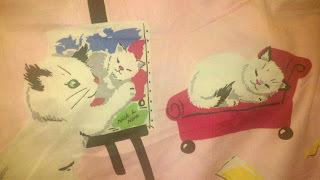 Stalker cat painting picture of sleeping cat that won't give him the time of day. Either that or it's a "Titanic" situation. He shall now be referred to as Jack. Sleeping cat now will be referred to as Rose. 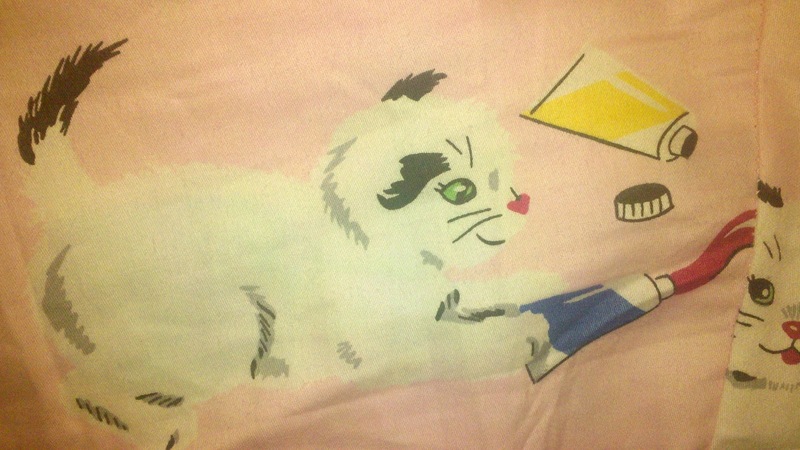 And then of course there's always a cat getting into mischief. 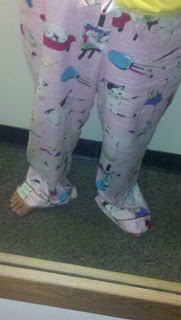 All 100% accurate snap shots from my new PJ pants. I pulled out these gems in the middle of Sabarro Pizza. "Well Jones, that's only one pair of pants. What else was in this starter kit?" Well what all cat lady's have. I also got my new driver's license. A mugshot one might see during a "Dateline" special where a woman kills everyone in her town. Here's where I bribe you. If I get 105 followers on this puppy (blog) I will post the picture. But I'm cheap and will show you for followers. In other news I tweeted that I had a dream about Cinnabon. They happen frequently but this one was super vivid. I got the last bun and was judged for it but I ate every last bite. I, Ashley Jones, was retweeted by Cinnabon. This is what is going on in my life. 1. My mom and grandma have lost all hope. 2. Cinnabon tweeted me and I photoshopped it and then blogged about it. I'm still waiting on ur party for getting 50 followers. I'm with April...when's the party? HAHAHAH I must have those pajamas!! !